Downtown United Soccer Club is proud to share that our recent Soccer Recycle donation has reached Haiti. 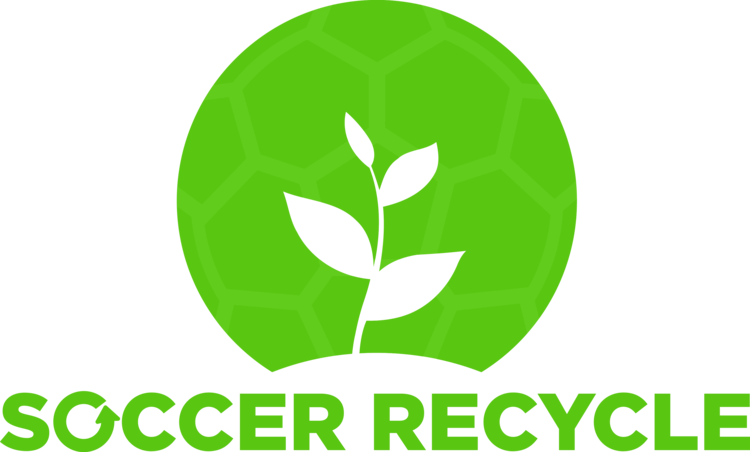 On March 9th & 10th, we hosted a Soccer Recycle drive in an effort to gather lightly used jerseys and other miscellaneous soccer items. Our item drop off was located right at the field entrance for Pier 40 during a busy and sunny weekend. Throughout the weekend, it was a common sight to see DUSC parents and families walk up to the donation bins in which they would empty bags full of former DUSC gear. The result of such generosity was a truck full of items which were to be donated to Haiti through a friend of the club, Jean Lagieerre. For more info on Jean, please check out our article that was released during the time of this Soccer Recycle here. In mid-April, we have been sent imagery and videos of the impact our community has made throughout Haiti. We would like to thank everyone involved in this season’s Soccer Recycle and encourage those to continue to help DUSC make a global impact. Below you can find video and imagery of our DUSC gear in action! 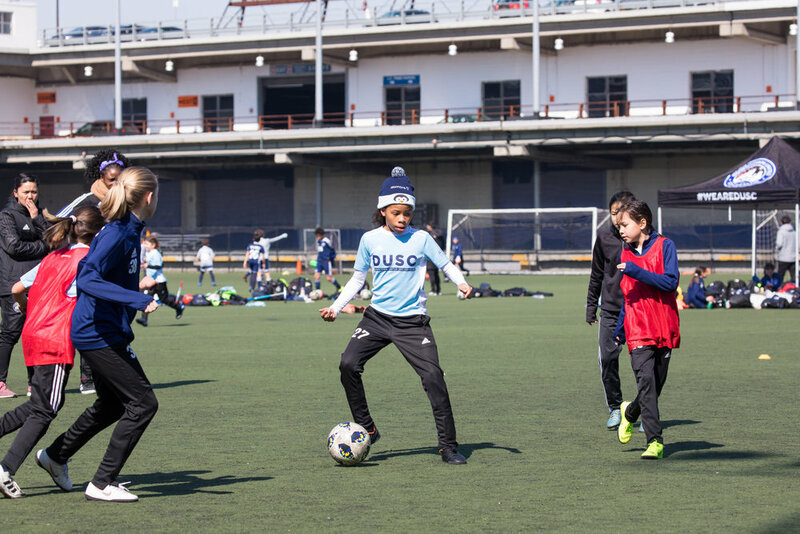 The weather cooperated on Saturday, and under full spring sun and a temperature in the mid 40's, 60 players took part in the second annual DUSC Spring Kick-Off Clinic. What made the day unique was that all of the players and coaching staff were female. Staffing the clinic were DUSC coaches Leanne Campbell, Nicole Carroll, Haley Chow, Oumou Toure and Sierra Kaufman. Joining them was NYU Head Strength and Conditioning Coach Kayleigh Fournier who took the girls through agility, coordination and strength building activities. The professional staff was joined by six players from the DUSC 2002 and 2003 teams who participated as assistant coaches, demonstrators and mentors to the younger players. Sarah Dwyer-Shick, DUSC Girls Goalkeeping TD and Special Projects Coordinator - Girls Development initiatives, reflected on the day. "Watching the interactions and dynamics between the coaches and players was eye opening and I am not sure who had more fun. With the popularity and growing numbers of girls playing soccer it is easy to forget that, while being on a field with coaches and players who all look like younger and older versions of you is an everyday occurrence for boys, it is one that female players rarely, if ever, have. To be able to be in an environment, for even a few hours, where everyone you interact with is someone that you can see yourself in can be an incredibly inspiring experience for both the players and coaches." Downtown United Soccer Club values leadership from within as a means to grow the person and the player. This 2018/2019 season we have begun to integrate leadership opportunities for our older Academy players to serve as mentors. 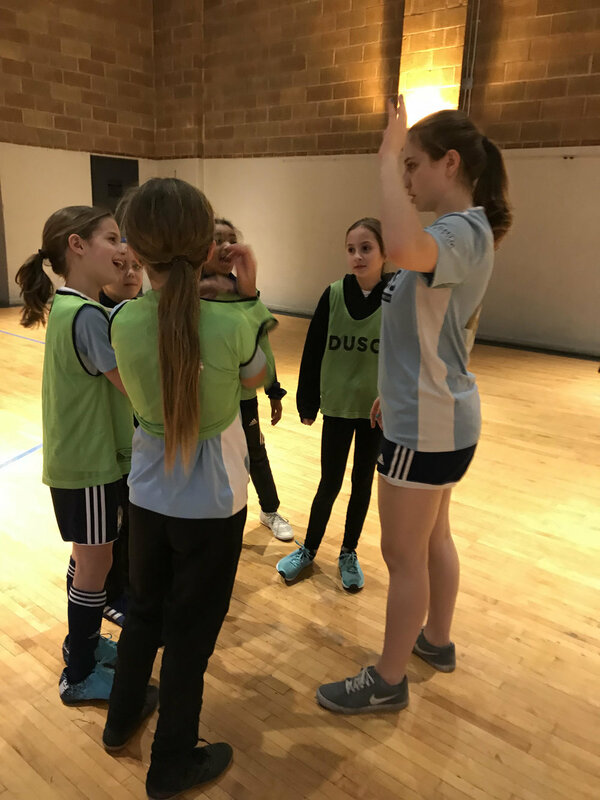 This cross age peer mentoring process places older DUSC players in important decision making roles and enables our younger athletes to interact with role their models. 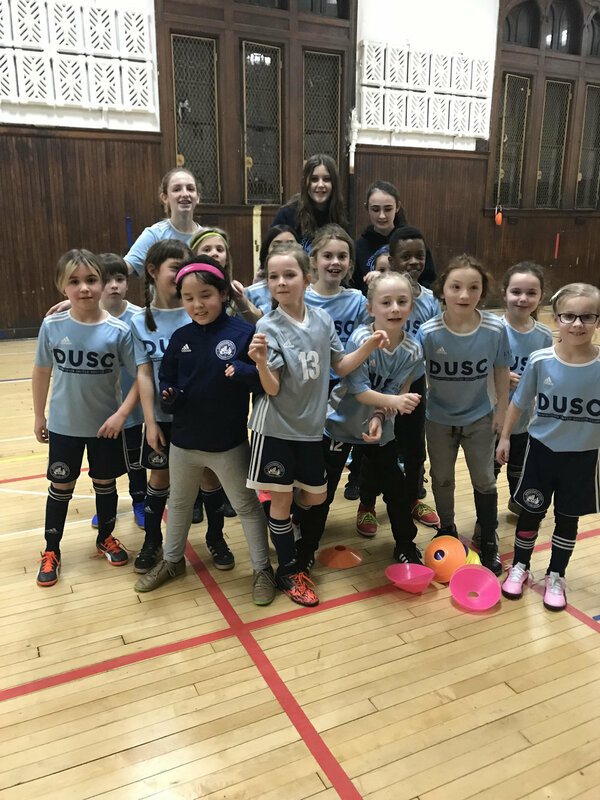 In 2018, DUSC launched programming designed to build culture and connections between the Girls Academy teams as well as provide additional leadership opportunities for players. As the winter season wraps we want to take a moment to highlight some of the events that have taken place so far. In the fall, DUSC 2006 and high school-aged teams took part in a joint session run by the coaches where players were able to work one-on-one with their younger or older counterparts. In January, the 2007 and 2008 teams had the opportunity to work with the 2000, 2001, 2002 and 2003 teams at the Columbia University Soccer Bubble. The session was led by the older players with the coaches filling the roles of assistant and facilitator. Throughout the winter high school-aged players have joined younger teams during regular training sessions. While the coaches facilitated these sessions, it was the high school players who took the lead planning and running the activities. As we look to the spring season events continue with the second annual Girls Spring Kick-Off Clinic. The coaching staff for the clinic will be all female and include older DUSC players who will work alongside the head coaches. Downtown United Soccer Club is proud to announce the addition of Leanne Campbell to our office and coaching staff. Leanne will join our Operations team and focus on scheduling of practices and games, organizing rosters via Sports Illustrated Play, and assembling cards for the girls academy. On the field, Leanne will support the Girl’s Academy teams and add quality and depth to our staff. Leanne grew up in Liverpool, England with playing experience at both Everton youth academy and for Liverpool Ladies FC. Leanne comes to DUSC with over 12 years of coaching experience. She has attained a National Diploma in Sports Coaching and Education, FA Level 1&2 courses, US E Licence, and Futsal Level 1 diploma in her time as a soccer coach. Leanne has previously worked for Everton America, a club which is affiliated with the Premier League club, Everton FC. At Everton American, Leanne was the head of the girls program. 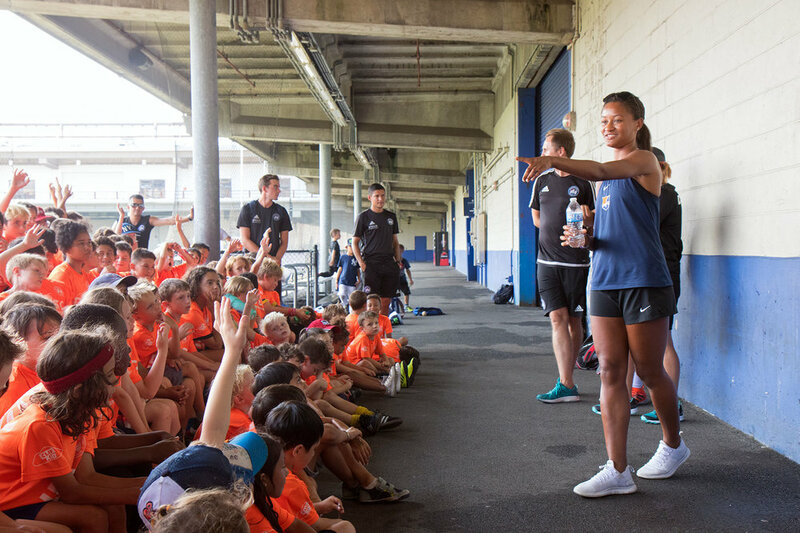 In addition to being the girl’s program head, she was in charge of the club’s operations which included all of Everton America’s summer programming. We are pleased that Leanne has found her #DUSCWay and cannot wait for what 2019 has in store. Leanne brings highly desired traits both on and off the field to DUSC. She has excelled as a program coordinator and director while also leading highly successful academy level teams at her previous clubs. Whether in the office or on the pitch, we are confident Leanne will be a dedicated staff member, a strong role model for our players and quickly become a valued ambassador for the club. Soccer Recycle Donation Drive Alert – On March 9th and 10th DUSC will be collecting lightly used sports wear and equipment to donate to Haiti. Please consider donating if possible. Downtown United Soccer Club is always looking for ways to give back to the greater soccer community. Over the last 12 months, our organization has worked with a man named Jean Laguerre to donate lightly used soccer equipment, clothing, and gear to Haiti. This is only a small piece of our Soccer Recycle program – a program that has supported the greater soccer community through clothing donations for the majority of the this decade. Jean has lived in the United States for more than 15 years and is driven to make a positive impact in the world through soccer. The club came into contact with Jean while he was working for Pier 40 as a Facility Security Guard. During his security shifts, Jean would see the passion our coaches and players had during games and training sessions. As we built out our relationship with Jean, we learned more about his relationship with the global game. He would show us images from his home in Haiti and the communities he’s involved with when he visits. Jean also shared how he grew up playing football in Haiti without proper equipment or resources – things we can often take for granted today. In fact, he spent all of his childhood enjoying the game any way he could regardless of what was at his disposal. It was a regular occurrence for Jean to play with no shoes and no uniform, and no traditional ball. He even explained that owning a soccer ball was rare. With this perspective, Jean wishes to change the reality for communities in Haiti. This is where the partnership between Jean and DUSC formed; at the crux of Haiti’s lack of accessible soccer equipment. Here’s how it works: we give Jean anything and everything soccer related from DUSC uniforms to lightly used cleats and soccer balls. He then uses his own resources to transfer the lightly used gear to Port au Prince, Haiti, where it is dispersed throughout the nation to various communities in need. Jean knows many of the village chiefs there and is able to respond to each village’s need. Jean has future plans to hold a soccer camp in Haiti on his father’s land. He has learned that it only takes a little bit of hard work to make a huge change. We as an organization are thankful to be a part of his mission – we have a united goal. To show his thanks, Jean gifted us a beautifully handcrafted wooden ship with Haiti inscribed on its sides. Needless to say, it is one of our office’s most prized possessions. Warm up this spring with a girls-only morning of soccer! This clinic will feature DUSC Academy coaching staff and special guest female coaches from outside the club. Open to players of all levels and experience. Joining the Spring Kick-Off Clinic as a special guest is Kayleigh Fournier, the head strength and conditioning coach at NYU. Fournier, a native of Millbury, Mass., previously worked at both Dartmouth College and Yale. She earned a Bachelor's degree in human performance at Florida Gulf Coast University and a Master's degree in physical education (emphasis on strength and conditioning) from Bridgewater State University. Sarah Dwyer-Shick, who is in her second year with DUSC, is the Goalkeeping Technical Director for the girls academy program and Special Projects Coordinator for Girls Development Initiatives. She is also currently in her fourth year as the Assistant Men's Coach at Dutchess Community College. 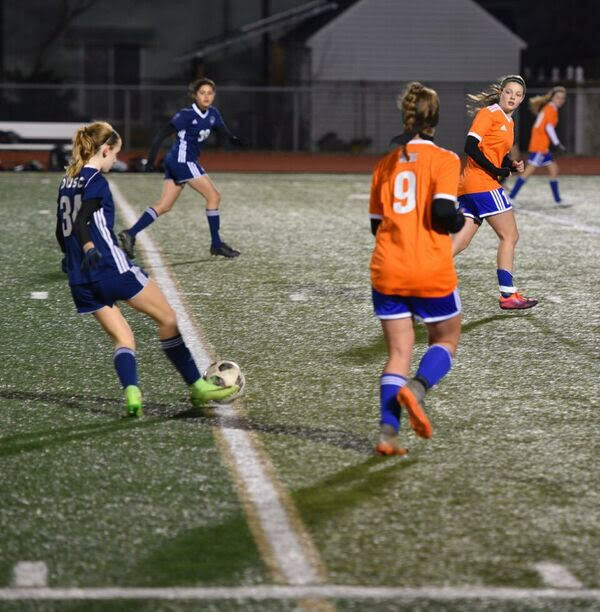 Prior to joining DUSC, Sarah coached at each of the three NCAA divisions including time at the University of Northern Colorado, South Dakota State University, Stony Brook University, Marist College and Pace University. At the youth level she served as the director of the Eastern NY Girls North Olympic Development Program for five years and worked with NY Rush/Patriots for eight. A multiple-sport athlete in college, she graduated from Smith College and later earned a Master's degree in Sports Management from the University of Denver. Her certifications include the U.S. Soccer Youth Licence, NSCAA Advanced National Goalkeeping and Director of Coaching Diplomas. She is also an NSCA Certified Strength and Conditioning Specialist. In 2017, she founded The Sports Bra Project, a nonprofit organization that works to remove barriers and increase access to sports opportunities for girls and women. Leanne Campbell, a native of Liverpool, England, is in her first year working in an operations and coaching capacity for DUSC. Campbell most recently worked as head coach and operations manager for Everton America in Connecticut. She also served as academy director at Southington Soccer Club and as a head coach at FC Somers. Campbell played for the Everton youth academy and for Liverpool Ladies FC. She earned her national diploma (UK) in Sports Coaching and Education, holds the FA Level 1 and 2 license. Nicole Carroll is in her second season with DUSC and is the head women's coach at Monroe College, a program she helped to launch on the school's Bronx Campus in 2017. A native of Bayside, Queens, Carroll was a three-time All CUNYAC goalkeeper for the City College of New York. She currently coaches the DUSC '08 girls team and also works with the club's goalkeepers. 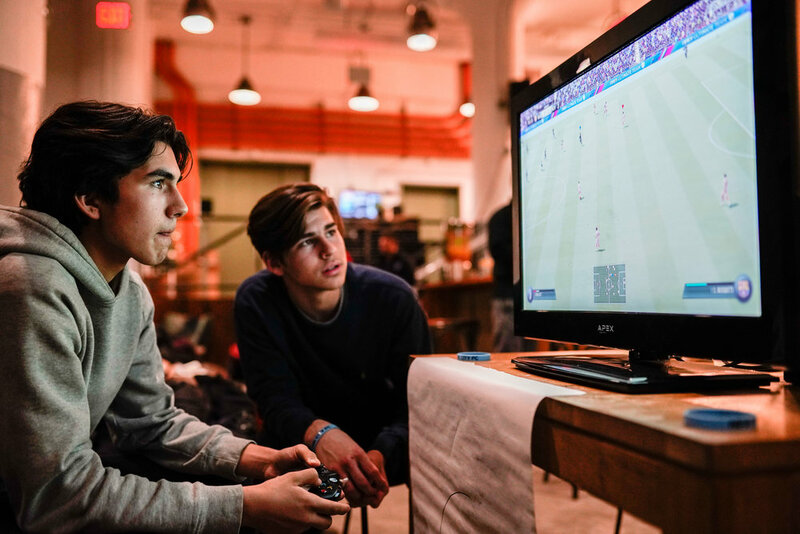 On Tuesday, February 12th DUSC hosted the very first FIFA tournament in club history. For the event, we partnered with WeWork and NYCFC to bring an engaging environment to our community. 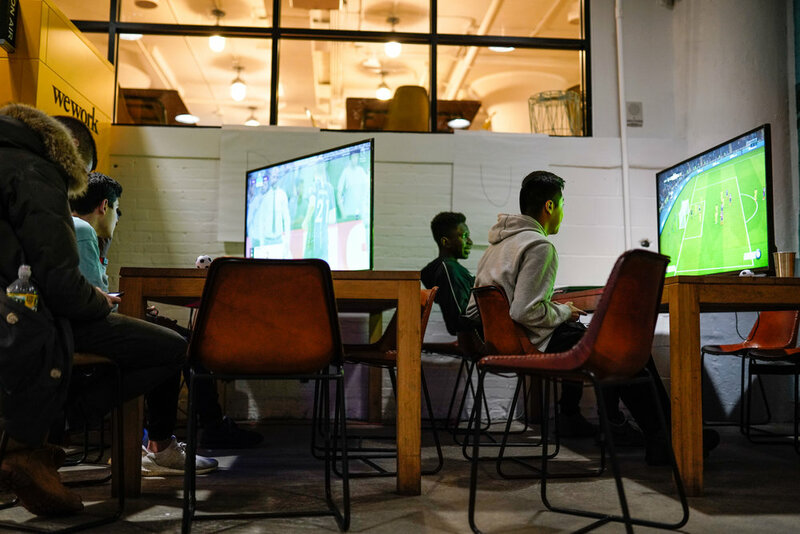 WeWork kindly provided the event space and NYCFC brought along their Pro FIFA Player, Chris Holly, and also provided great prizes! The rules of this 32 person tournament were as follows: 1) registrants were to be from our high school aged teams/programs or our WeWork building 2) games would be single elimination and played with 6 minute halves 3) competitors had to stick with the team they picked throughout the entire tournament. Everything kicked off at 5:30pm with the first round showing the likes of PSG, Juventus, Barcelona, and Man City as popular team selections. 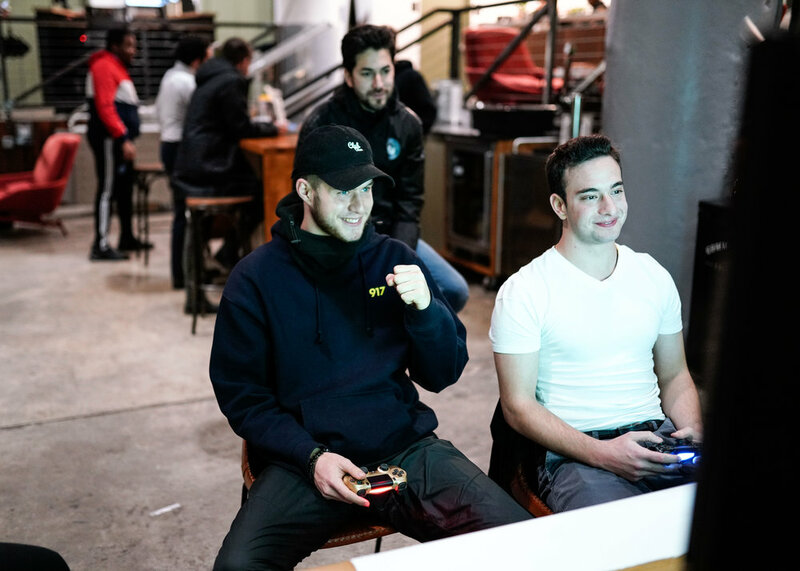 NYCFC presence filled the event space as tournament competitors battled each other with focused faces and locked eyes on the TV set ahead of them. Games were filled with heartbreak and triumph - several of which went to penalty decisions. After all, a lot was at stake this evening. The winner of the inaugural competition went home with two tickets to NYCFC’s 2019 Home Opener, a NYCFC Home Jersey, their own copy of FIFA19 for PS4, and perhaps the best of all...a chance to play FIFA Pro, Chris Holly. Holly is ranked amongst some of the best FIFA players in the world and represents NYCFC in eMLS competition, the official FIFA league for Major League Soccer. Chris joined us to spectate the latter rounds of the tournament and to offer a Q+A session for our competitors. Around the midpoint of the evening, our competitors took a break to enjoy some pizza and listen to what Chris had to share about his career as a Pro FIFA player. Holly noted how, just as any skill in life, playing professional FIFA requires relentless practice and effort. As the tournament came to a close, the group found DUSC B2003 Blue’s Marvin Heilbronn and DUSC B2000 Blue’s Jeremy Tetroashvili in the final. At the end a close fought match, Marvin’s Barcelona side fell 0-2 to Jeremy’s Man City. Jeremy took home the grand prizes – that of which included a final match and eventual 7-1 loss to Chris Holly. But, all things equal, it’s not exactly the Leicester City story. We want to thank NYCFC, Chris, and all of those who helped bring this event to life. We look forward to hosting more opportunities like this in the future. 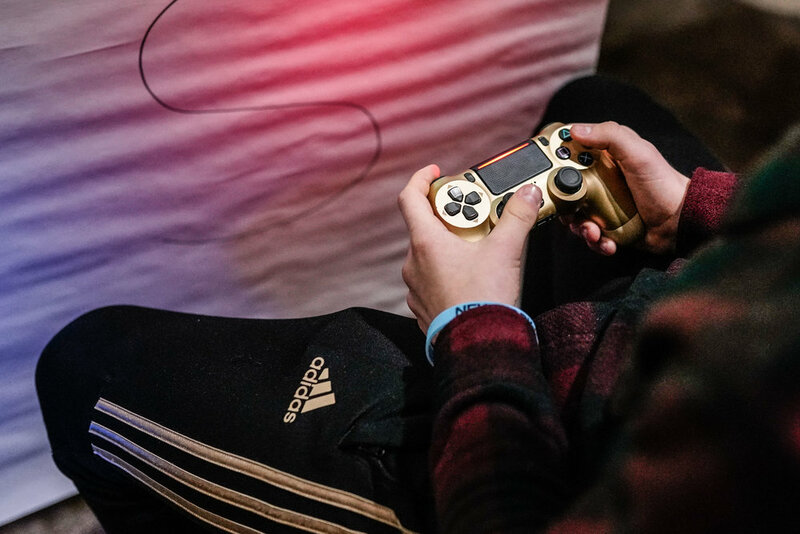 Who knows, maybe you’re our next FIFA champ? *Imagery taken during final stages of the tournament. DUSC has a strong presence in the College of Staten Island Men’s Soccer team. The CSI Men’s program currently has 5 players and 1 coach who are DUSC alumni. Coach Alex Cuba, our B2003 Blue Head Coach, is the Assistant Coach for the CSI program. He shared with us some info on this past 2018 season and how our former players are doing at the DIII environment. The first Alumni we checked up on was Bryant Navarro, who had himself an outstanding season. The forward led the team in scoring and points, led the conference in scoring and in points, was the 7th highest scorer in the country, a 1st team All-Conference player, and a 3rd team player All-Region. Quite a mouth full. Bryant finished the season 4th for all time goals in one season for the CSI program. Keep in mind this is only Bryant's sophomore season. Next up on the DUSC Alumni roster is Michael Arellanes. Michael is a 3 year starter and has been an integral piece for the program. Arellanes combines his versatility, skill, and tremendous knowledge of the game to allow himself to be used all around the midfield; no easy task. The 3rd DUSC Alumni, Chris Li, is another individual that fits the utility mold. Chris is versatile, strong, and skillful. As Cuba described, Chris plays the game the right way and is always willing to put the team first. In fact, Cuba shared that Michael and Chris are best of friends and have been a tremendous help in instilling the culture desired at CSI. We’d like to think that friendship was formed all those years playing at DUSC. Macki Dougoune is the 4th DUSC Alumni and was the CUNYAC conference rookie of the year. He too works in the midfield with Michael and Chris. Macki is, “a force to be reckoned with as he dominates the center of the park on any given day.” Cuba expressed that Macki is the epitome of the type of player CSI seeks out when they recruit. Simply put, Macki is a great kid with a huge passion for the game of soccer. He continued to share that Macki’s willingness to put the team above all else is a quality every player can aspire to. In fact, Cuba’s favorite memory from this season was seeing Macki show up for preseason. “Being able to see his goal of playing collegiate ball finally come to fruition was fantastic to me. I wanted everyone to see how talented this young man was and there he was jogging in for his first day of preseason, wide eyed and smiling right before sprints started” added Cuba. Our 5th and final DUSC Alumni is Ryan Layman. Ryan was the captain for CSI this past year. He is a 3 year starter and also a 2x All-Conference team player. Cuba noted that cool, calm and collected is the easiest way to describe Ryan. “He’s smart, incredibly talented, self-motivated, a true leader and holds himself accountable. Ryan has all the qualities the CSI program looks for in an athlete and he's an even better person than he is a player” praised Cuba. Just as it is valued at DUSC, culture is central to the CSI program. Their goal is to bring in athletes that understand the commitment not only that soccer requires, but also that the college requires on the academic side. The CSI ask is that their players self-motivate in all aspects of their lives. This hunger is what drove the team to improve their team from a 10-7-2 record in the 2017 season to a 15-4-1 record in the 2018 season. They also to reached the finals of the CUNYAC. While they may have lost in the conference finals to Baruch College in dramatic fashion, their hunger remains. Coach Cuba says that without a doubt you can expect to see the players putting in the work in the weight room or on the futsal courts this winter. Images courtesy of the College of Staten Island Athletic Department. 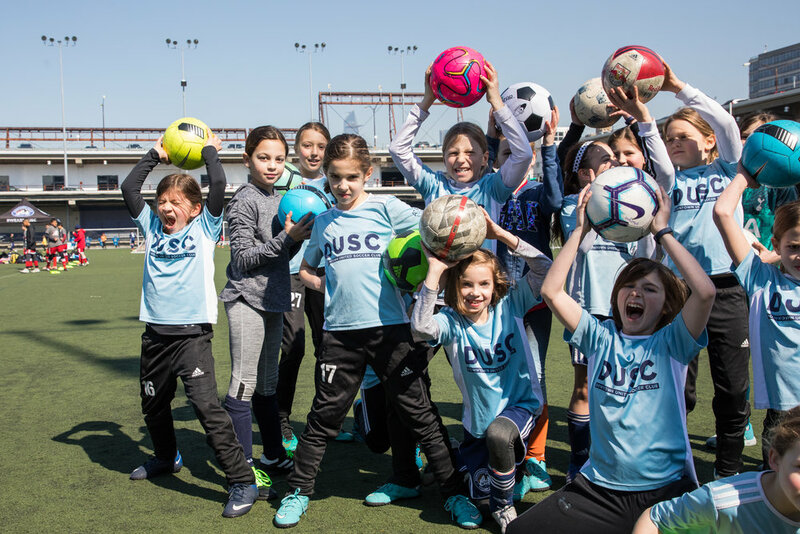 New York, NY – Downtown United Soccer Club, the U.S. Soccer Foundation, and the New York City Department of Education announced a partnership to expand Soccer for Success through the city’s CHAMPS before and afterschool program. Through the partnership, as many as 2,000 students will be engaged in Soccer for Success, the Foundation’s afterschool program offered free to participants and proven to establish healthy habits and deliver positive heath and youth development outcomes. The collaboration also supports the Foundation’s It’s Everyone’s Game campaign to ensure children in underserved neighborhoods can benefit from all that the game of soccer has to offer. This program year, the Foundation is on track to engage 100,000 children nationwide in Soccer for Success. “We are thrilled to collaborate in this innovative partnership to provide opportunities for all players to be active and engaged in the beautiful game,” said Tom Frambach, General Manager at Downtown United Soccer Club. “We’re incredibly excited to start this partnership with the U.S. Soccer Foundation and Downtown United Soccer Club to keep our kids moving and active. Nothing is more important than the health and well-being of our students, and this collaboration provides our students with the tools to lead healthy and productive lives throughout their time in school and beyond,” said Deputy Chancellor of School Climate and Wellness LaShawn Robinson. Supported by CHAMPS and Downtown United staff, U.S. Soccer Foundation representatives recently held a local training wherein CHAMPS teacher-coaches became certified Soccer for Success coach-mentors. This first year of partnership extends to June 30th, 2019. Every participant will receive a ball and jersey. This collaboration represents a significant milestone on the way to engaging one million children annually in Soccer for Success by 2026 as a part of the It’s Everyone’s Game movement. For more information, how to stay updated and ways to get involved, visit itseveryonesgame.org. The CHAMPS Sports and Fitness Program is an initiative of the New York City Department of Education’s Office of School Wellness Programs. CHAMPS promotes physical activity among children in elementary and middle school before and after the school day. The program helps students engage in activities regardless of athletic or physical ability and promotes connections and involvement throughout the school community. The name CHAMPS derives from the initials of the five values that define its participants: Cooperative, Healthy, Active, Motivated, and Positive Students. They U.S. Soccer Foundation’s programs are the national model for sports-based youth development in underserved communities. Since its founding in 1994, the Foundation has established programs proven to help children embrace an active and healthy lifestyle while nurturing their personal growth beyond sports. Its cost-effective, high-impact initiatives offer safe environments where kids and communities thrive. Headquartered in Washington, D.C., the U.S. Soccer Foundation is a 501 (c) (3) organization. For more information visit www.ussoccerfoundation.org or follow us on Twitter at @ussoccerfndn and Facebook at www.facebook.com/ussoccerfoundation. Our 5th Annual Benefit was a celebration to remember. This year we found it only fitting to make our theme The World Cup as we looked back on a wonderful Men’s tournament and look ahead to the Women’s competition in the 2019 summer. November 8th, 2018 found Sound of Brazil lively as ever with the very popular VR Penalty Shootout Station from a year prior reincorporated along with a custom DUSC photo booth. The night kickoff with guests arriving to classic 70s and 80s tunes whilst a DUSC slideshow was shown on the big screen. Auction bidding began upon arrival, in which guests could place their bets on a range of items until the night’s end at 9pm. Some notable items were a Historic 5 Bedroom House in the Adirondacks for 6 Nights, NYCFC Exclusive Closed Training Session in 2019, and a Signed 2018-2019 Real Madrid Jersey amongst many others. At the night’s midpoint, President of the DUSC Board, Andy Scruton, made remarks on the various DUSC programs we offer. Following his remarks, Kevin McCarthy hopped on stage to interview the evening’s Guest of Honor, Heather O’Reilly. Heather O’Reilly is a 3 time USWNT Gold Medalist and 2015 Fifa World Cup Champion. In an engaging Q+A, Kevin asked Heather about some of the most memorable moments of her career. She was quick to harp on USWNT culture and how there’s space on the pitch for both joy and ravenous hunger for success. We want to thank everyone who helped make this year’s Benefit a huge success. The funds we raised will go towards creating more pathways for NYC youth to enjoy the beautiful game. A priceless piece of the DUSC formula and part of the greater reason why our organization exists. If you were unable to attend this year’s Benefit, we invite you to make a donation to support our cause. We thank you for your consideration. Fall of 2018 brought a collection of new academy coaches to the DUSC family. Each individual brings a unique skill set and background to the club. We’d like to introduce you to these new coaches and give you some background information on their accomplishments. Travis Blair - Travis is the Head Coach of our G2005 Blue and G2006 Orange teams. Before beginning his coaching career, Travis played for Wheaton College in Massachusetts. It was there he received DIII All-American recognition in 2014. Some of his previous coaching experience includes Assistant Coach of the Concordia Men’s program. Kimani Calnek - Kimani is no stranger to the NYC soccer community as he worked for South Bronx United and Asphalt Green before coming to DUSC. He currently is the Director of Youth Development/Assistant Coach for MLK Boys HS Soccer aside from his role as our G2001 Blue Head Coach. Nicole Carroll - Nicole is the Head Coach of our G2008 Orange team. Nicole played for Concordia before transferring to CCNY to finish her collegiate career. In 2012, she set the CCNY school record for shutouts in a given season (12). Nicole then went on to coach at CCNY, Monroe College, and now, DUSC. Haley Chow - Haley joins us on the Academy side this fall. She was a Spring Classes Coach last year and is now our Assistant Coach for the G2002 Orange team. Her resume touts Division 1 experience for the Princeton Women's team, which surely will translate on the pitch to our players. Eleri Earnshaw - Eleri is the Head Coach of our G2000 Blue team and brings plenty of experience along with her. She is the current Head Coach of the LIU Brooklyn Women's Soccer team with a UEFA B License. Prior to coaching, she logged an extensive career on the pitch. Eleri played for her home nation, Wales, as well as the North London club Arsenal W.F.C. Sierra Kaufman - Sierra hails from the west coast with experience in coaching younger aged athletes. She is the current Head Coach of our G2012 team. Alvaro Acosta - Alvaro is our 2009 Development Coach. He grew up in Miami, Florida playing at Kendall Academy SC for their USDA side. Alvaro also spent a year playing abroad in Italy in the Serie C youth division. Werner Dasbach - Werner is the Head Coach of our B2003 Orange team. He has a wealth of experience including knowledge from being the women's head coach at NYU and Associate Men's Head Coach at Berry College. Werner has a USSF A License. Esteban Silva - Esteban is the Head Coach of three DUSC teams this fall: B2011, B2009 Orange, and B2008 Orange. He spent 10 years coaching for BW Gottschee, proving he knows the NY soccer environment well. Esteban has a USSF A License. By the way Katharine speaks you wouldn’t think she is a 17 year old high school senior preparing to take her next steps in life. With a mature tone, Katharine explained how she was born and raised at DUSC. She started her Recreation career at age four playing for team Ethiopia. As it turns out, she was paving the way for a long tenure at DUSC. With clearly a keen eye for history, Katharine found herself on the first DUSC girls travel team. It was on this team that she played until the spring of 2017, when she became a volunteer coach for DUSC Recreation. In quick succession, Katharine became an Assistant Coach to the program. Her time as an Assistant Coach was brief as she was quickly promoted to Head Coach. Becoming a Recreation Head Coach is part of the continuous development of The DUSC Way for Katharine and symbolic of her enduring commitment and passion for DUSC. To support Katharine’s continued development, DUSC was happy to endorse her USSF coaching license for grassroots competition. Katharine took a near 5 hour course divided into two sections: classroom learning and real life implementation. Katharine spoke to us about her new journey as Head Coach for a Recreation team and what about Recreation impacts her the most. She explained that Recreation is everything and anything. It is a mix of players touching the ball for the very first time in an organized fashion combined with seasoned players looking to have plain fun. For many, she explained, it is a period of exploration; What is soccer to you? For all, she continued, it is a wonderful community building experience. We asked her to look back at one of her favorite moments from Recreation so far. She was quick to explain that her first Head Coach as a Recreation player was Oumou Toure, current G2011 and G2010 Academy Head Coach. Take a guess who her first Head Coach was when she was an Assistant Head Coach for Recreation? You guessed it, Oumou Toure. This full circle experience was a truly special moment for her. Katharine explained how life long friendships can be formed in Recreation because it is pressure free. There are no team cuts or evaluations made, just pure sporting fun. She noted that some of her best friends throughout her soccer career started in our Recreation program. As we finished our chat, she explained that her favorite part of a Recreation season is opening day. As she put it, “little bundles of joy are running around and uniting around the coaches…” That sounds like a beginning of the DUSC Way to us Katharine, don’t you think? This is a Q+A with Alex Valles, our new DUSC Program Assistant. Inside the office, Alex helps with the staffing of coaches for classes and ensures the Recreation League runs smoothly each and every weekend. Outside of the office, Alex coaches a handful of our Classes & Clinics. We sat down with him to chat about his connection with soccer growing up, his move from Panama to America, and what he thinks is most important when coaching young players. DUSC: You were born and raised in Panama City. How long did you spend there? Alex: I lived in Panama until the age of 13. DUSC: What was your transition like moving to America? Alex: It was a bit difficult at first because of the language barrier and the sudden cultural change. I adapted quickly however and made friends through sports, especially soccer. DUSC: Is there something specific that attracted you to work in soccer? Alex: I wanted to be involved with it as much as possible. I got into coaching helping out with sessions in college with the freshman team and really enjoyed it. There's a good feeling knowing you can have a positive impact on the players and watch them apply the skills you've taught them. DUSC: When you boil it down, what is soccer to you? Alex: It's just a big part of my life. It revolves around everything I do. If I'm not coaching, I'm playing, reading/talking about it or watching on TV. I'm always eager to learn new things about the game as well. DUSC: You spent 8 years with Super Soccer Stars / NY Stars Premier - what inspired you to move to DUSC? Alex: I am very grateful for my time there but felt it was the right time for a change. I have several friends coaching for DUSC and they told me about how they were like a "family". To be honest, I sensed a feeling of unity and a great bond amongst these coaches. I was at Pier 40 a lot so I could see how they interacted with each other and how organized they were with their Academy sessions. I also loved what I read on the website from their core principles to their affiliations with NYCFC and Sky Blue FC. DUSC: You have extensive experience working in the recreational soccer space, what do you think is fundamental to a great Classes program? Alex: Plain simple, keep it fun and positive. Be organized, be prepared, and create a fun environment where players can learn at their own pace and can enjoy the social aspect of it as well. Spending time with their teammates, working together on the field, celebrating goals, high-fives etc. These things are fundamental. Of course, teach them the technical skills they need to know in order to get better as players, but always do it in a way where they actually enjoy it. Introduce fun games with the ball where they're mastering their footwork, using different parts of their foot, changing direction etc. Praise them, but also challenge them and correct their mistakes. Lastly, teach with enthusiasm and a positive attitude. Players feed off of positive energy. The more positive the class, the better the class. DUSC: Can you tell us a bit about your coaching philosophy? Alex: I have an overall philosophy for whichever level of soccer I'm coaching. Ultimately, I want players to realize their full potential as players and as individuals. Stressing important values such as discipline, respect, and good sportsmanship are essential and a must for proper player development. My ultimate goal is for all players I coach to develop the soccer skills and self-confidence they need to be successful. And to also learn life lessons from the sport which they can apply later in life. DUSC: Is this something that has changed over the years? Alex: Yes, it has. Although it has remained somewhat the same, I have made some changes to it. I think is inevitable for a philosophy to not evolve throughout the years. I base everything on my own experiences as a player and coach. DUSC: What are the steps you take to create a positive atmosphere in Classes? Alex: I think it just starts with a positive attitude and the willingness to teach with enthusiasm. Creating a positive class/team culture is important and it makes a big difference on the field. Allowing players to share responsibilities where they have to work together in class, giving them individual attention when needed, communicating to them their progress and how well they're playing, also correcting their mistakes "Nice effort, but try this next time...", challenging them, praising them when you have to etc. These things work well for me when coaching and make for a positive class atmosphere. DUSC: If you could run the same Classes session forever, what would you focus on? Alex: Great question! I'll probably focus on sessions that maximize touches on the ball. I think dribbling is the single most important skill in soccer so it's important to develop sessions where players get a lot of touches on the ball and work on their first touch. Players enjoy playing games like sharks and minnows, pac-man dungeon, king of the ring, lose your marker, bingo gates, stuck in the mud etc. All of these are fun games where the ball is at the players feet and there is constant motion, change of direction, and need for awareness. DUSC: Looking forward to our DUSC calendar, what aspect are you most excited for? Alex: I'm excited about the Annual Benefit at SOB's. That should be a lot of fun. But I'm also looking forward to the coach trainings I'm helping put together. Looking forward to the Winter season as well for the Recreation league and Classes. Downtown United Soccer Club strives to offer soccer for all, regardless of ability to pay or ability to play. Our community is our bedrock and every year we spend a single night honoring such a foundation. This year we ask you to join us in celebrating our 5th Annual Benefit. With 2018 & 2019 being World Cup summers, we found it only appropriate make the World Cup our benefit theme! We want to gather our community and share cultures just as the World Cups have the power to do. The night will be full of positive energy, wonderful food, and a surely world class auction. Help us continue to provide New York City with soccer for all as a vehicle for personal development and growth. Your support and donations go further than you can imagine, as the DUSC Annual Benefit generates invaluable funds for our club. It enables us the ability to provide financial scholarships and opportunities to our community members. Join us on November 8th by purchasing a ticket below! Many of you are familiar with the I am DUSC book that can be found in the player resource page on the DUSC website. It is a player directed journal that will help prepare players on their journey as they develop, grow and hopefully become the best they can be — both on and off the field. It centers around 11 Character Strengths and their application in the game and in life. This year DUSC is integrating these character strengths into the practice curriculum each month. September was Preparation. Below you can see a sample of the guidelines and suggestions our staff were encouraged to weave into the fabric of their practices and games. Most importantly it was made clear that as we guide and encourage our players to be prepared, it is imperative that we model excellence in Preparation through our actions and behaviors. Player development in an organized environment is a key to nurturing a confident and skilled player. Preparation in our organization does not revolve around perfect spaces and surfaces, but rather purpose and clear functionality. Preparation is synonymous with a growth mindset. It is the belief and understanding that technical and tactical abilities can be developed. When players take stock of their equipment, think of how they should rest and eat before and after games, watch games on tv, practice on their own, they are resource priming -- using a clear and systematic way to prepare for the upcoming challenges on and off the field that activates their strengths and increases the likelihood that they will be successful and have a joyful, satisfying soccer experience. October is Effort. At DUSC we have an experienced, educated and licensed group of coaches. Yet, we coach our coaches that intention, energy - Effort - are the foundation of the best developmental platform. Without that formula for Effort, players would not respond, grow or enjoy their soccer experience. Integrating the belief that Effort is one of the most crucial aspects of performance and completely under their control, is a mantra we expect our players to embrace both in training and in games. It is reflected in many ways - work rate, hustle, body language, transitions - and a core strength of any successful player and team.